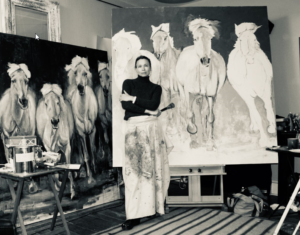 Isabelle Truchon Art will present paintings from her Collection, Roam, at Historic Long Branch House & Farm from May 1st-June 30, 2019. This exhibit will feature new work by the artist, inspired by the wild mustangs of the Steens Mountain Wilderness region of Oregon. Roam will explore the history of the horse through time, with a focus on the modern wild herds that still roam in America today. The opening of Roam will take place on Friday, May 3rd from 6pm-8pm and include a light reception and a talk by the artist. Long Branch will also host a museum exhibit curated by the National Sporting Library and Museum of Middleburg, and the Clarke County Historical Association. Both the museum exhibit and Isabelle’s paintings will be up through the month of June.